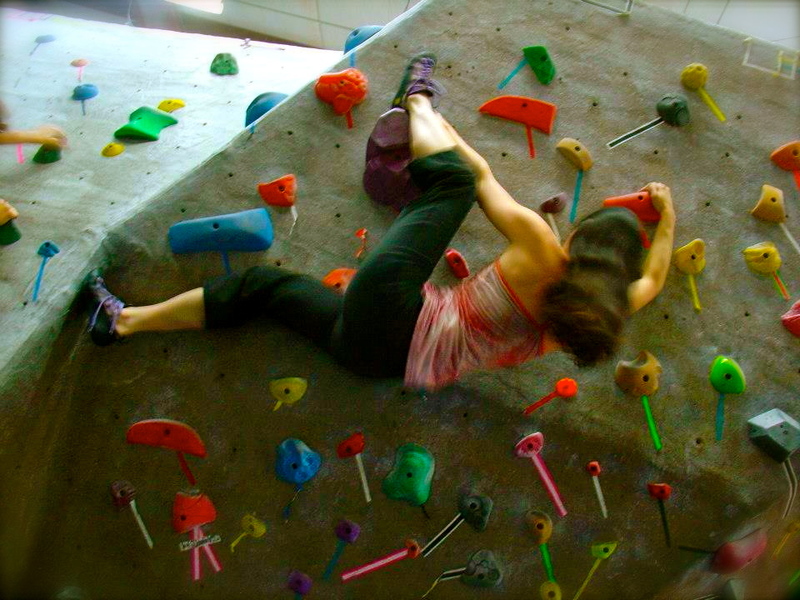 Interview of local climber Dana by guest author Nikki! Nikki has done a beautiful job writing a series on fear and eventually we will be touching up on all kinds of interesting topics that deal with how therapeutic climbing is. Thanks to Nikki for all your awesome work and time and Dana for the interview. Enjoy! What started your interest in climbing? 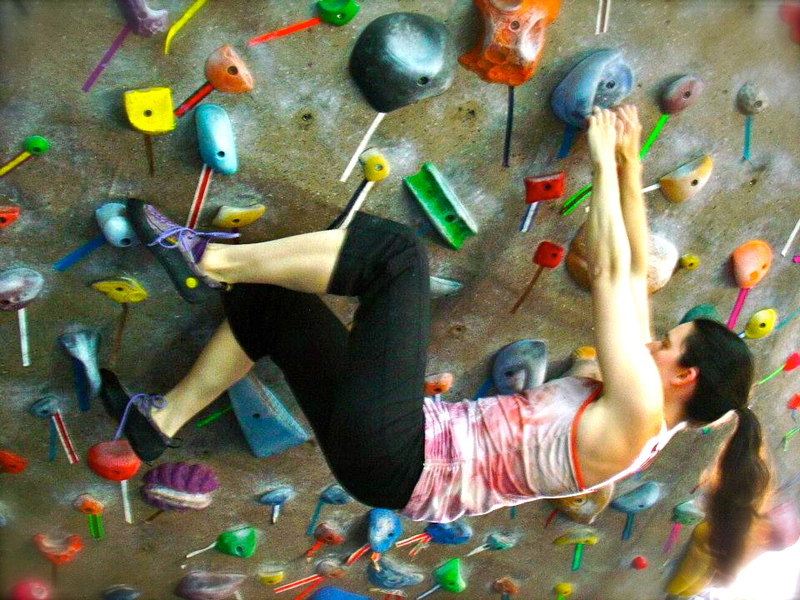 My roommate in college, Joy, was an avid climber, and invited me along to the school gym. I was skeptical, but enjoyed it. Her excitement for things was always infectious. How long have you been climbing? Tougher to answer–I climbed a few months in college, maybe once a week, around 2003 or 2004, then for a few months in Seattle three years ago, two to three times a week. Finally, just over a year ago, I started a membership at TRC and I’ve been climbing ever since, two to three times a week. You’ve told me you use climbing as therapy. What fears have you been working on through climbing, and how has climbing been applicable to these fears? Primarily, I’ve been working on my fear of heights. I found that my fear of heights had really gotten to the point that I couldn’t stand on a second-floor balcony or walk across bridges next to the railing, but if I climbed regularly, I could handle these situations better (still not any better with heights more extreme than this). Frequently, when inviting others to check out climbing, someone will say, “No, I’m afraid of heights”, so I quickly point out “I am too; but this is like therapy.” This seems to shock people, but I’ve heard before the old cliché about confronting your fears, and in this case, mild, safe exposure helps me to modulate my reaction to similar situations later. The other fear I’ve only recently admitted I have is a fear of, I don’t know, failure in front of others? Basically, I love games, and am excited to play new ones, be it videogames or board games, but when someone invites me to a game night, I’m excited up until the point where I would have to join in and play. At that point, I make some excuse and bow out and sit on the sidelines listening. I think the fear is mainly about holding everyone else back while I learn, because I don’t have this issue with games I’m already familiar with. The same fear extends to the climbing gym–I’m fine when the gym is empty-ish, and I’m fine when it’s so packed you feel anonymous, but when it’s just the right size crowd, I end up backing out of new or difficult climbs and saying I’ll try the route next time. Perhaps I feel like others waiting to climb in the same area will be annoyed with my wasting time if I’m not good enough? It’s still kind of a hard fear to put to words, but maybe some of you will understand what I mean. Can you discuss your approach to overcoming your fears thus far? So far I mainly just keep climbing. I have good days and bad days, some days I feel “off” and do very little and am very fearful, other days I’ll feel confident and have really stellar climbs. Either way, it ends up being a feedback loop–poor days get progressively poorer, but each great climb or new move I accomplish encourages me to tackle new, harder problems. It’s just important to not let one off day lead to an off week and then an off month…I have to “get back in the saddle.” For me, having a routine is key–I climb two to three times a week, period (unless I’m injured or sick).It’s the same for other, non-fear based things. If I want to stick to a certain eating pattern, or trail running goals, or anything really, it has to happen regularly or the easy routes in life just get in the way and stay there. Some people work better in a less rigid structure, but I don’t. Now, I’m not ruthless about it–I can climb any days that week, afternoon or evening, as long as it gets done. I can have other plans, I can just not feel like it, but only within reason–I cannot use the same excuse over and over. Most of that is self-discipline because I know myself well enough, but I still struggle all the time to not procrastinate simply because I can. What do you feel motivates you most to keep pushing past your fears when you most want to give in? This is really key when you’re struggling with self-discipline like me–it’s important to have a partner or cheerleader. David is my climbing partner and he pushes to go, when I’m maybe reluctant. Once I get there and exercise, get some endorphins going, I’m glad I went, but it can be hard to get moving. He also encourages me to try a route anyway when I’m wanting to put it off. The same goes for the Meetup Group and other “regulars”. You get to where you recognize people, you all hang out around the same set of routes for a while and rotate through, all trying routes and encouraging each other, and it helps give you the confidence boost that “Hey, I can do this.” TRC is amazingly social and encouraging of each other and I love it. Even if you can’t get someone to join you in your exact exercise routine or therapy for your fears or what have you, be they either an existing friend or creating new alliances through groups like Meetup, it’s also really motivating to have someone you can chat with about your experiences, even long distance. My sister Carly and I might not even be working on the exact same goals, but we can call each other up and say, “Hey, I’m trying to do , could you ask me about it or remind me to be strong and not give in?” and you can then call each other up when you’re not sure you can keep going or when you are proud of a success and it helps reinforce that someone’s got your back and you can keep going, even if your track record isn’t perfect. As you know, there are times where climbing is truly dangerous. How do you determine the difference between a justified/rational fear and an irrational one in climbing? I used to argue that all of my fears were justified. I think for me, the balance is to not be afraid of truly “safe” situations, like walking on a sidewalk across a sturdy bridge, and I’m happy with that for now. 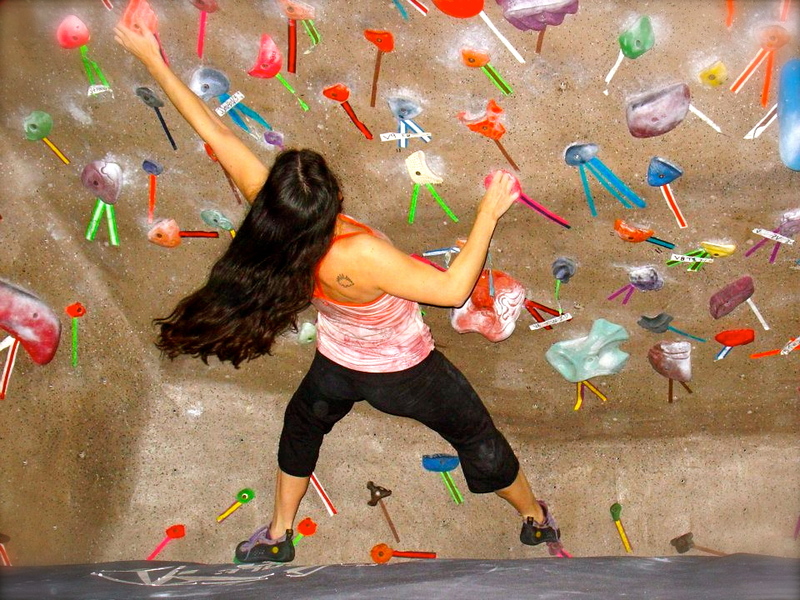 I am climbing only in an indoor gym, not outdoors, so it’s a pretty controlled experience. My injuries have been your basic scrapes and bruises that accompany any exercise (or in my case, walking across a room and bumping a coffee table). I am super good at double checking safety knots on my own, and I only climb with someone I completely trust on the other end of the rope, or I simply boulder and that’s just me trying interesting moves over a pad that isn’t that far below me. Were there thought processes you had to change in order to improve your performance? If so, what were they and how did you change them? Similar to my previous answers- my main problem is a feedback loop of negative experiences and excuses coupled with my tendency towards procrastination. I mainly just have to have a routine and friends to encourage me so that I keep trying again another day and don’t let my fears fester and grow. I’m not sure I’ve changed my thought processes so much as I’m simply aware of them and openly acknowledge they’re there so that I can’t sweep it away in denial too much on my own and so that my friends can keep tabs on me at the same time. 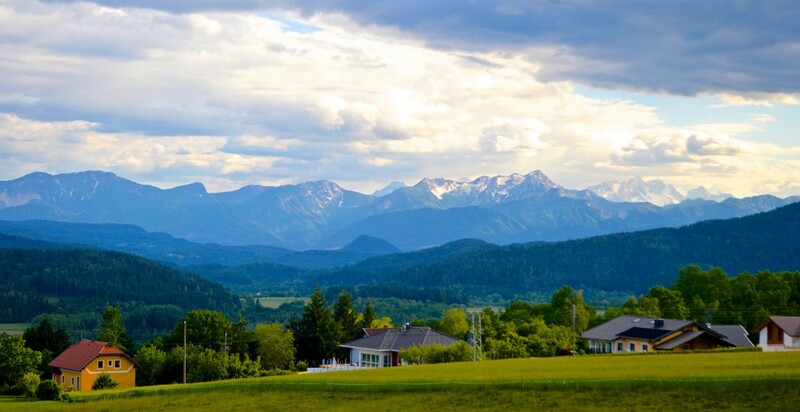 Do you feel your life outside of climbing has changed because of using climbing as therapy? How so? I certainly can stand on someone’s deck or walk next to the railing across a low bridge like an average person now after climbing. I’ve also gotten in a lot better shape, and get the “happy brain” exercise chemicals to help combat other doldrums, so the fringe benefits are great. To top that, I’ve made new friends at the gym and have a great conversation topic when talking with new people. Hopefully, some of these people who shared my fears, or see parallels to them in their own lives, have been positively impacted and stretched outside of their comfort zones in a positive way. What are your current goals in climbing and how do you plan to achieve them? Currently, I’m in my friend Ashton’s Fitness challenge and am trying to beat a 5.10 top rope route, which I’ve never done. I have beaten harder bouldering routes, but once I get up high on the wall, some days a 5.6 is all I can convince myself to finish. Next after that would be trying to get lead belay certified. Not sure I want to do a lot of that, but if I could learn the skills, we’ll see. Bouldering is going so swimmingly that I haven’t set specific goals there other than “oh, that route I was trying last time I want to get another move further on today.” Granted, I’m kind of cheating there–I tend to try much harder routes in bouldering, so the limiting moves are much closer to the ground, and tend to avoid the “easy” climbs because that would mean I would have to deal with topping out and dropping down. Any other tips for people wanting to overcome their fears through climbing (or otherwise? Have a squadron of support–someone else who shares your goals (try out a Meetup group to meet one if you don’t already know one, or speak up and introduce yourself), someone who is a great listener, or someone who has their own goals and you can back each other up, or all of the above! Be happy with little successes and don’t let past failures preclude trying again. We all slip. I have fallen off various wagons for years, but that doesn’t mean you can’t climb on the next one that rolls by.